Ladies and gentlemen, it's time for another round of Lutefisk Sushi! 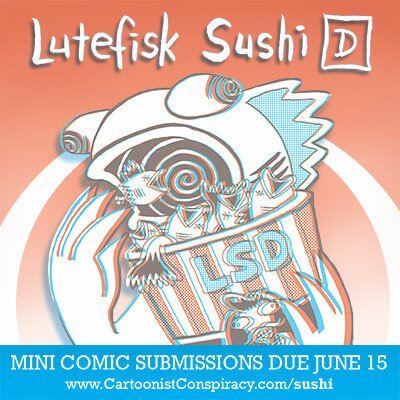 Lutefisk Sushi is a nearly-yearly art show that invites Minnesota cartoonists to create and submit 160 copies of an original mini-comic. These comics then get divvied up into 160 screen-printed bento boxes (hence the "sushi"). Submissions are due June 15, but the fun starts in August when the actual gallery show opens at Altered Esthetics. The show features the sushi boxes, as well as original art from the mini-comics. Best of all, the show is NOT curated, so any Minnesota cartoonist who can print up 160 comics will get in the box. The home base for everything sushi is: www.cartoonistconspiracy.com/sushi. 2) Create a mini-comic. How? Check out this pdf for a handy tutorial. 3) Make 160 copies of your mini. A "mini-comic" can be anything, as long as it fits in a 6" x 8.5" box. Read this to find out how to get a discount on printing in the Twin Cities. 4) Scan your cover. You will need a jpeg of it for the next step. 5) Fill out a submission form HERE. 6) Drop off or mail your mini-comics to: Altered Esthetics, 1224 Quincy St NE, Minneapolis, MN 55413 Comics must be received by JUNE 15, 2010. 7) OPTIONAL: Frame your original art from the mini-comic. Although it's not a requirement, we HIGHLY encourage you to frame and submit your art to the show -- the more art on the walls, the better! You may sell your art or label it NFS (not for sale). Mail or drop off art at the address above. Clearly label all pieces with your NAME, TITLE, MEDIUM, and PRICE. Frames should be black and NOT have glass (i.e. use plexiglass). 8) Get the word out! Blog about Lutefisk Sushi using the jpegs below, follow the show on Twitter, and most importantly... become a FACEBOOK FAN! JULY 31 -- Framed artwork due. JULY 31, 1-3pm -- Artists' Potluck (come and hang out, meet fellow cartoonists, and drop off your artwork). AUGUST 6, 7-10pm -- Show opens at Altered Esthetics. AUGUST 21, evening -- Party at AE with the Sushi crowd and the folks from the Minneapolis Indie Xpo. If you have any more questions, check the website or email artist liaison Dan Olson: bewilderedkid [at] gmail.com with the subject line "Lutefisk Sushi Question." If you have questions specifically regarding the gallery show or about submitting framed art, contact Kristin at kristin [at] alteredesthetics.org. One of the cool thing's about this year's show is that the featured artist, Danno Klonowski, has drawn the cover in classic red/blue 3D. Your comics are obviously not required to be in 3D (because that would be a huge hassle), but if you like a challenge, consider doing a 3D comic or submit some 3D art to the show. Each box will come with 3D glasses, so go wild! Over the next few weeks I'll be writing tutorials on how to create 3D comics. Alright, now get drawing! We (the sponsors and organizers) can't wait to read this year's batch of minis! Bioshock 3 Game Infarcer cover!